Once you've entered your data into ProStock, it can help you retrieve it in several different ways. The software has various reporting features that allow you to see marketing and sales history, find your best (and worst) clients, photographers, and staff, track the "ins and outs" of your cash account, and much more! Each screen allows you to print a single record, in a format which you can customize. 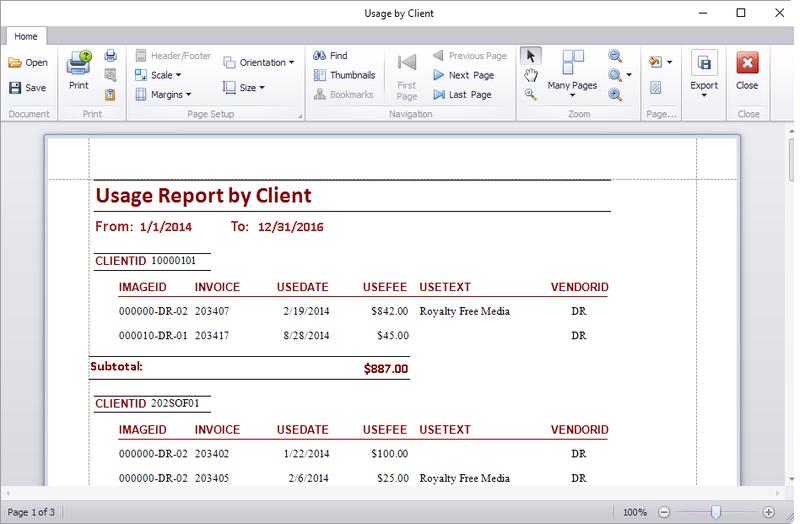 This is handy for printing a single client, photographer statement, image record, and individual memos or invoices. When you want a list, ProStock can print that, too! List receivables, payables, images, and more. Use our built-in Report Reader/Writer to view best selling images, top photographers, delinquent clients, daily deposits, commissions due, etc. ProStock comes with built-in ledger reports, marketing reports, sales tax reports -- it can automatically print your 1099 forms! Generate statements, or reminder letters for clients who have overdue Invoices -- each designed to print directly on your letterhead, or PDF's.